FIRST DADS, by Joshua Kendall. How do these guys stack up in the fathering department? Author Joshua Kendall has whipped up a dandy light-history read! 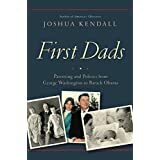 FIRST DADS is filled with stories, tidbits and gossip about our Presidents – and how they stacked up as fathers. Or not. The author begins with an important premise (not stressed enough, IMHO), that the concepts of fatherhood have undergone major changes over the past half-century, and our über child-centered generation uses an arrogant yardstick to measure our “betters.” Or at least our used-to-be betters. Most of our pre-1960 (an arbitrary date) POTUS-pops followed the paterfamilias role: Head of the family. Bread winner. Giver of guidance. Provider of examples, character and morals. And supreme (and final) authority in the household. The easy-read is filled with dozens of stories, sometimes dishy, sometimes poignant, sometimes plain fun and sometimes “tsk-tsk”-able. All are meant to be enjoyed. But it appears (again IMHO) that author Kendall must have struggled to find the politically correct way of presenting a simple un-PC concept: Let us be honest: not all of our Presidents enjoyed children – or at least the company of children. No doubt every one of them would fight to be first in line to condemn anyone who abused, mistreated or harmed a child, as is all too common today. But actual enjoyment of children and child-play was (and is) not always as appealing as we are supposed to believe. Given the choice after a hard day’s work, POTUS or not, tired Pop would probably opt for an easy chair, scotch, slippers and newspaper rather than disheveled offspring clamoring for his attention. But you cannot come right out and say it – at least not now, perish the thought. There were of course notable exceptions. Theodore Roosevelt, whose wife considered him her “seventh” child. He not only loved, nurtured and guided his children, but was leader of the pack. He made time, even as President, to play with Archie and Quentin and their pals. On the flip side of TR, (and the man was a prism of sides!) he also took an annual 4-6 week vacation – sans wife and kids. He preferred hunting and camping and “naturing” with adult companions. And despite all his efforts at daddydom, none of his offspring (including daughters) were particularly successful – or happy. Ditto, U.S. Grant, who adored his family, and was perhaps the most lenient of all POTUS fathers. Then there were the Presidents whose spousal relationships far surpassed their relationships with their children, notably John and Abigail Adams, the Madisons and centuries later, the Reagans. And as dads, they were far from stellar. The Papa Johns (Adams & son Quincy) were unquestionably fine men who tried to instill fine qualities in their offspring. But they were dispositionally unsuited and generally failed miserably. Interestingly enough, in their old age, they mellowed considerably, and were much better grandpas! POTUS-pops also have as much in common with each other as differences. Educating one’s children is a constant – 250 years notwithstanding. President Obama is deeply concerned with his daughters’ education. George Washington’s voluminous correspondence includes numerous letters between him and his stepson’s teachers. President O. has bright girls who like to learn. Poor President W. alas, was pulling teeth trying to make a scholar out of Jack Custis! And the delightful tales of a kindly Rutherford B. Hayes (who knew?) personally accompanying his college-bound sons to settle them into school is one of those deliciously heart-warming stories that fill Kendall’s book. But the author sidesteps the conjectureable situations, and doesn’t even raise the obvious questions: would Lincoln have been a better father had he lived? Would FDR have been a more engaged father had he not had polio? What would JFK have been like as a Dad – had he lived? There are no answers of course – but plenty of hmm questions! Today’s world, smarmy with know-it-all intolerance for past culture, is awash with a couple of generations of child-worshiping (Kendall’s phrase) parents-as-playmates, enablers and social directors. Judging by the percentages of now-grown children who are on drugs, in jails, unfit for living in society etc., etc., this may not be the best recommendation. Maybe our forefathers really did know better. Perhaps “paterfamilias” is better than pater-too-familiar, after all. But one thing remains clear. The bottom line that fatherhood is not easy. Or always fun. Or even successful. But it is always important. FIRST DADS is a delightful summer read: quick and easy, pick-up-and-put-down-able. Thoroughly enjoyable. Full of insights and wisdom. We might even learn a few things. This entry was posted in A POTUS-FLOTUS Blog, Recommended Reading and tagged "First Dads", Fathers in the White House, Feather Schwartz Foster, George Washington, Jack Custis, John Adams, John and Abigail Adams, John Quincy Adams, Joshua Kendall, President Obama as father, President Theodore Roosevelt, Presidential fathers, Presidential history, Rutherford B. Hayes, Rutherford B. Hayes as father, Theodore Roosevelt, Theodore Roosevelt as father, Ulysses S Grant as father, Ulysses S. Grant. Bookmark the permalink.